Because each failure reduces productivity, maintenance teams set up plans for monitoring industrial processes. The aim of these plans is to identify and correct anomalies on installations by means of inspections and measurements before those anomalies reduce or halt production. Chauvin Arnoux measuring instruments are widely used both in regular preventive maintenance programmes and in corrective maintenance operations on installations or the machines connected to them. By organizing regular preventive maintenance on an industrial process, it is possible to keep equipment or installations in perfect working order over the long term, while reducing the probability of failures. The preventive maintenance plan thus includes systematic surveillance of the key elements involved in the industrial process. This surveillance notably includes regular measurement and inspection operations. Analysis of the history of these data may also trigger conditional or predictive maintenance operations. For example, the detection of ageing or deterioration of certain parameters will trigger pre-failure maintenance, thus limiting the corrective maintenance necessary. To guarantee the safety of people and property with regard to electrical installations and the equipment connected to them, reference standards and/or regulations govern the testing of certain parameters on the installation, switchboards or machines. To avoid interrupting the process, it is important to check the continuity of the protective conductor and the quality of the earth electrode, in order to ensure satisfactory equipotentiality between the installation reference and the machines connected to it. 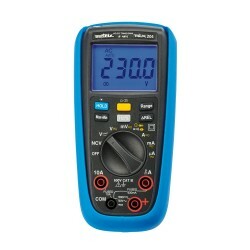 This avoids common-mode voltages, which may cause failures in the various sensitive electronic stages used to control and automate the process being powered. Insulation of the conductors, in relation to one another and to the chassis, is essential in order to limit the leakage currents to earth which could influence the effective tripping thresholds, thus interrupting the process in progress. Lastly, by checking that the rated tripping values of the cut-off devices such as line circuit-breakers, RCDs and/or fuses are maintained, you can ensure that, in normal conditions, no untimely tripping will occur to interrupt the power supply. In the context of systematic or conditional operations, the earthing is checked with earth testers using the 2P, 3P or 4P methods, or with loop testers, depending on the installation's configuration. To ensure that the insulant meets the requirements, insulation resistance measurements are performed with insulation testers, also known as megohmmeters, at test voltages ranging from 1,000 V to 10/15 kV. This method is ideal for monitoring insulant ageing during the operation of equipment or an electrical installation so that it can be replaced if necessary. To test the operation of RCD-type cut-off systems, RCD testers are used. All these various measurements on an installation can be performed with multi-function installation testers. At the level of the machine and in addition to the tests listed above, a machine tester can be used for dielectric testing (flash testing) to check that the insulant withstands overvoltages. More specifically, an electrical appliance tester can be used to test the electrical safety of all the portable electrical equipment, machines and electrical control switchboards directly. Multimeter clamps are very simple to use for measuring currents and leakage currents, particularly as their versatility means they can often be used for many other measurements as well. More specific tests can also be performed, such as monitoring of the metallization and continuity of certain elements using a micro-ohmmeter, or monitoring of the transformer ratios with a ratiometer. Because they are so quick to set up, no-contact temperature measurement systems have become essential tools for guaranteeing the safety of industrial production conditions. With infrared thermometers or thermographic cameras, it is now possible to detect thermal behaviour anomalies by relative or absolute measurements. In mechanical maintenance, this investigative method can be used to check for abnormal overheating (wear, bearing faults, insufficient lubrication, etc.). The widespread use of electronic power supplies in industrial processes is leading to an increase in harmonic disturbances on the electrical network which directly effects the quality of the energy distributed. In the short or medium term, these disturbances may eventually cause failures in all the electrical equipment connected to the network. Harmonic currents have negative effects on almost all the components of the electrical system by generating new dielectric, thermal and/or mechanical stresses. Electrical network analysers or harmonic analysers are then essential to quantify all the harmonics present on the network and to find a suitable solution. Maintenance of machines' electronic command and control systems requires measurements on the printed circuit boards where dynamic signals and different electrical references coexist side by side. Portable oscilloscopes with isolated channels are the ideal tools for such tasks. With their multiple functions, they combine the possibilities of a digital oscilloscope, a multi-channel multimeter, a harmonic and FFT analyser and a logger. In the case of bus analyser oscilloscopes, they can also be used to check the transmission status of the signals exchanged by bus between the systems. Certain production or transformation tasks require control of parameters such as the pressure, temperature, flow rate, level, etc. These parameters govern the operation of the processes and are kept at predetermined levels by control and slaving techniques. Equipped with measurement and simulation functions (for current, voltage and temperature), portable calibrators are used during commissioning and maintenance of these measurement lines. Their uses include 4-20 mA or 0-10 V process loop tests and verification of temperature measurement lines. In the context of pump maintenance, motor efficiency or compliance verification operations, various techniques may be used to measure the rotation or displacement of objects: stroboscopic method, contact tachometry or optical tachometry.